The Minnesota Department of Natural Resources captured two bighead carp May 11. The capture took place during a search on the St. Croix River to recapture a tagged bighead carp they have been tracking as part of an invasive carp pilot project. The bighead carp were captured in Anderson Bay on the St. Croix River. One was a 46-inch, 39-pound mature male, and the second was a 43-inch, 46-pound mature female. Neither fish showed indications that they had spawned this year. They were removed from the water and euthanized, and further lab analyses will provide more detailed and useful information about the fish. Two Bighead Carp Where Captured in the St. Croix River. 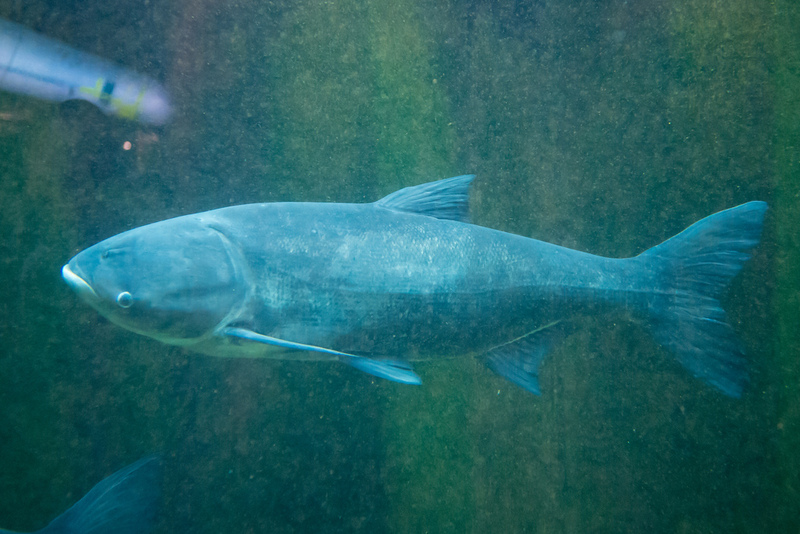 The capture of the two bighead carp, an invasive species, is the result of the pilot project to track tagged invasive carp to learn more about their range, habitat preferences and other behaviors. Because of the signal from a small implanted transmitter, DNR fisheries staff know the location of the tagged carp. While high water can complicate a capture operation, fisheries staff, along with U.S. Fish and Wildlife staff and commercial anglers, are resuming efforts to recapture the tagged carp this week. The DNR is permitted to track up to two invasive carp in the St. Croix or Mississippi River at any given time. Anyone who catches a bighead, grass or silver carp must report it to the DNR immediately. Call 651-587-2781 or email invasivecarp.dnr@state.mn.us. Take a photo and transport the carp to the nearest fisheries office or make arrangements for it to be picked up by a DNR official. Individual bighead carp were first captured in Minnesota in 1996 and 2003, with more frequent reports in recent years as the DNR’s response and public awareness have grown. Invasive carp initially escaped into the Mississippi River from southern fish farms where they were used to control algae. These large fish compete with native species and pose a threat to rivers and lakes. No breeding populations have been detected in Minnesota waters. Individual bighead and silver carp have been caught in the Mississippi, St. Croix and Minnesota rivers. More information about invasive carp is available at www.mndnr.gov/invasivecarp.